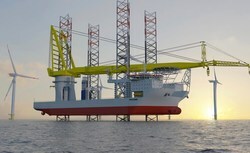 Next generation offshore wind turbines need next generation vessels. These new turbines can be more than 270 metres high and are fitted with blades of 120 metres long. Offshore installation vessels currently available on the market are facing increasing difficulties to install these types of turbines due to the turbines’ sizes and installation heights, as well as the ever-increasing foundation dimensions. Not only will the Voltaire be ready for the future of offshore renewables, the vessel will also be deployable for the oil and gas industry, and for decommissioning of offshore structures. The crane specialist presents its new up-tower crane for wind turbines at the beginning of the year.